After the board’s decision Thursday, construction at the new wing of the Delaware Area Career Center Consolidated Campus will cease at the end of the month. DACC Superintendent Mary Beth Freeman said the board waited until the new wing was structurally sound to approve the suspension so the construction would not become compromised during the delay. The Delaware Area Career Center Board of Education has formally ordered that construction at the consolidated campus be halted and that a repeat of their renewal levy be placed on the ballot. During the meeting Thursday, the board approved a suspension of agreements between the DACC and SHP Leading Design and Elford Inc, the design firm and construction company working on the DACC’s consolidation project at the south campus. The potential suspension of agreements comes months after the DACC learned it would not be receiving any money from a renewal levy that was passed by voters in 2015. In 2015, voters in Delaware County passed the DACC’s renewal levy by 10,644 votes and the center would have begun collecting taxes this January from Delaware County, as well as small portions of Union, Morrow, Marion and Franklin counties. The DACC appealed to the Ohio Supreme Court and asked that the court order the Department of Taxation to approve the levy because all of the potential votes from the other four counties could not have caused the levy to fail even if all the voters had voted against the levy. However, the court did not order the levy be authorized. At the meeting on Thursday, the board discussed the suspension with Eric Bull, the vice president at Elford. Bull told the board that their subcontractors have been briefed on the situation and will find short-term construction work until the construction at the DACC can resume. Bull said he and his team are now working to determine how much more the $45 million consolidation project will cost because of the delay. Until the construction was suspended, the board had been receiving regular updates that the project was on budget and ahead of schedule. The board was told that crews would finish pouring concrete at the new parking lot before they suspend construction. June 30 will be the last day for construction at the DACC. DACC Superintendent Mary Beth Freeman also gave the board an update on Ohio House Bill 124. HB-124, authored by State Rep. Andrew Brenner (R-Powell) and State Rep. Rick Carfagna (R-Genoa Township), would create an extension of the renewal levy in Delaware County and would only place the levy back on the ballot in the other four counties. Freeman said the bill has been amended by the Senate Ways and Means committee and will likely be sent back to the House next week. Freeman said she is hoping that the bill is passed before June 30, when state legislature takes a recess. Freeman said if the bill is passed by the house and senate it must then be signed by Gov. John Kasich. The board then voted to place a .08-mill levy on the November ballot in all five counties to replace the 2015 renewal levy. Freeman said that if House Bill 124 passes the board will then place a levy on the ballot in the other four counties and remove the five county levy from the ballot. The next board meeting will be held on July 20 at 6:30 p.m. in the board room at the DACC South Campus. 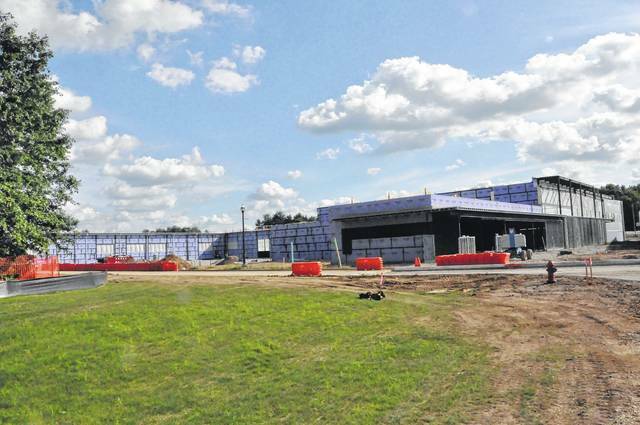 https://www.delgazette.com/wp-content/uploads/sites/40/2017/06/web1_DSC_0162.jpgAfter the board’s decision Thursday, construction at the new wing of the Delaware Area Career Center Consolidated Campus will cease at the end of the month. DACC Superintendent Mary Beth Freeman said the board waited until the new wing was structurally sound to approve the suspension so the construction would not become compromised during the delay.